Sept 7th One Day Sale! It is days away from my 11 year anniversary of quitting my last job, waiting tables at Khan's in Roseville, to dive headfirst into a full time freelance art career. I was driving home with Tim Shindler from Flatstock 5 in Seattle, sure that the time was right to make this move. I had just gotten my first comic book job drawing a graphic novel for Lerner Publishing (entirely because Bill Hauser pointed them in my direction), and thought everything was falling perfectly in place. The last 11 years have been anything but easy, filled with as many disappointments as successes, plus the constant stress of, "Who will hire me next?!" & "How will I pay this bill?" I've made about 500 posters, drawn 7 graphic novels, a handful of murals, and a ridiculous amount of other work, and somehow I've kept scraping by. The regular occurring jobs I have, creating art for The Growler , The Beer Dabbler & the Zombie Pub Crawl have been my only consistent income, and I am grateful for that. These days I have finally zeroed in (at long last) on what I do best, which is comic books. I've got several projects cooking with Jesse Snider, I just inked a Back to the Future story penciled by Brent Schoonover that will be published in October from IDW, I have a few personal projects in the early stages, as well as teaching comic book drawing at the Art Academy (where I just had my 1 year anniversary). 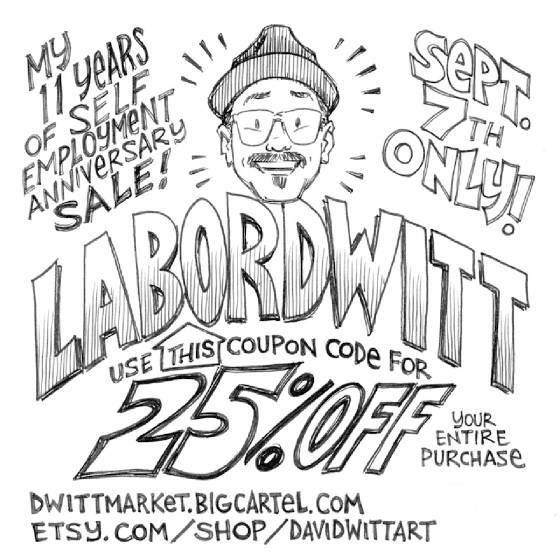 To celebrate my milestone, I'm offering a 25% discount for one day only (Labor Day) on my work by using the coupon code LABORDWITT at either of my online shops. It's a way of saying thanks for supporting me through the years. Whether through kind words, Facebook and Instagram likes, visiting my studio during the Saint Paul Art Crawl, buying my work, or hiring me to create something. Also, of course, by this time next year Nikki & I will have a son, & I need to make more money.